The river Nile, over 800km in length within Ethiopia and the longest river in Africa, holds part of its heart in Ethiopia. From lake Tana, the Blue Nile, known locally as Abbay, flows for 800 km within Ethiopia to meet the white Nile in Khartoum to form the great river that gives life to Egypt and the Sudan. It has been said that the Blue Nile contributes up to 80% of the Nile’s flow. 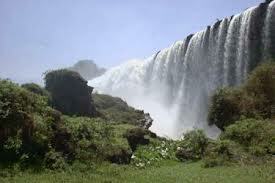 The Blue Nile Falls are about an hour by tour bus from Bahar Dar. Known locally as Tis Isat, the falls are over 400m (1312ft) wide and 45m (148ft) deep. Because of a series of dams near Bahar Dar, they aren’t as impressive as they used to be. Nowhere, is it more spectacular than where it thunders over the Tisisat Falls literally ” Smoking Water” – near Bahar Dar. Here millions of gallons of water cascade over the cliff face and into a gorge, creating spectacular rainbows, in one of the most awe-inspiring displays in Africa. The Blue Nile falls can easily be reached from Bahir Dar and the Scenic beauty of the Blue Nile Gorge, 225km from Addis Ababa, can be enjoyed as part of an excursion from the capital.